I have to admit when I first saw this Catwoman-inspired Chanel ad for Fall 2011, I wasn't entirely sure it was even real. 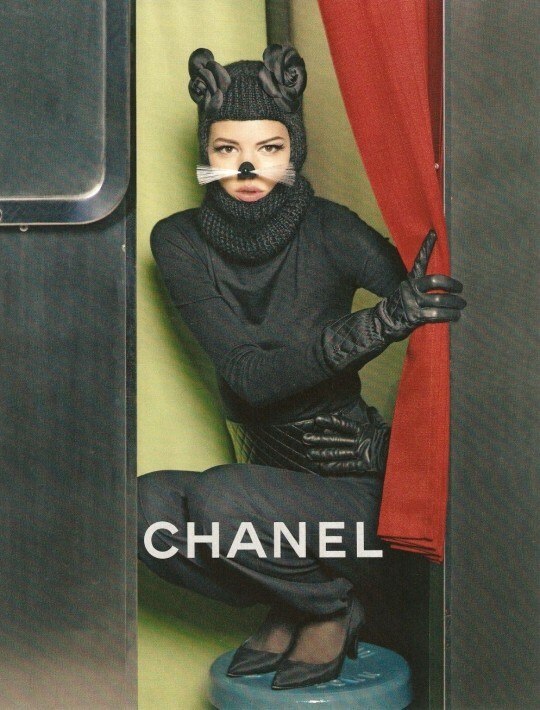 Danish model Freja Beha Erichsen models the cat burgler-esque ensemble, which includes a faux nose and set of whiskers, styled by former French "Vogue" Editor-in-Chief, Carine Roitfeld. While I always appreciate a good cat fashion shoot, I probably would've preferred to have seen some real domestic cats instead of this weirdness. But I'm not a former "Vogue" editor, so what do I know? In other interesting cat fashion news, Grazia is reporting that Victoria Beckham just announced she's working on a lower priced line called "Victoria" for Spring 2012. The confounding part is that she claims the collection is inspired by teen goth cartoon icon Emily the Strange, and will feature "magical prints" such as clouds, moons, and "lots of cats." The kitty prints even have their own names: "Victoria cat" and "Cutey cat." Currently there aren't any pics of the feline fashions available, but as soon as anything is released, you know I'll be on it! Lagerfeld is a visionary so if he's putting cats on the catwalk that means he KNOWS cats are in! Everyone knows Karl Lagerfeld is a little crazy, but this is nuts even for him - LOL!!! I think Posh's dress is adorable! She looks like a cat to me. I find it weird that Victoria Beckham is doing an Emily the Strange inspired line. I'll be very interested to see it. I hope that it's actually affordable.